This show is a vajazzling experience. 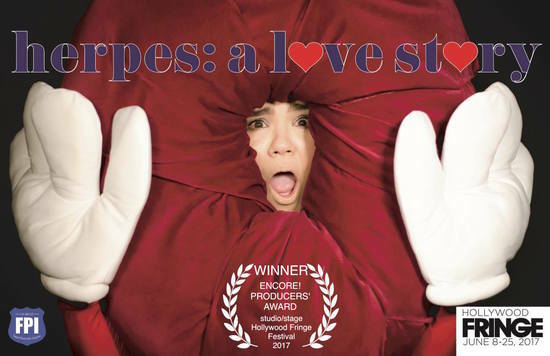 Appearing as an array of characters, Cherise Pascual acts and sings her heart out as she tells the tale of a young woman discovering she has herpes and the variety of ways she chooses to deal with it. The course of true love never does run smooth, and when you throw herpes into the mix, anything can happen. From boyfriends, to doctor’s exams, to the Island of Celibacy, there’s never a dull moment. Her emotional honesty is disarming, and her comedy, infectious ( oops- did I really say that?) This woman is a powerhouse, and you leave the theater longing for more. There was nothing about this performance I didn’t like. The use of multimedia added dimension and variety to the presentation, the musical parodies were wonderfully wrought and performed, and the set was designed so that you got the feel of different scenes even though this was a one act show. This is a show not to be missed. It’s funny, brave, heartfelt, and a perfect showcase for the enormous talent that resides in its star and playwright, Cherise Pascual. I hope the 2017 Hollywood Fringe is only the beginning of its life on the stage. It’s about time herpes came out of the closet, because it’s here to stay. Thanks to Cherise for shining a light on this topic and reminding us that it’s not what happens to us that’s important, but how we respond to it.